This episode, Adrian speaks with illustrator Eric Scott Pfeiffer. Pfeiffer is a multi-faceted artist with inroads to comic books, editorial illustration and concept design. Eric's first comic book series with writer Alex Paknadel, 'Arcadia' was recently collected into a trade paperback by BOOM Studios. Eric discusses 'Arcadia', his upbringing in a creative household, attending Virginia Commonwealth University's renowned Communication Arts program and becoming one of the distinguished alumni currently making waves in the art world. There's some real talk about his brief experience with almost getting a Hollywood storyboard job and the inspiration thereof that made Eric seek a another avenue for his work. All that plus Eric details his work process on his upcoming comic book series 'The Forevers' with writer Curt Pires. Eric is available online at ericscottpfeiffer.com. SHOW NOTE - (24:56): Renowned comic book artist Kelley Jones began his involvement with DC Comics' Batman in the 1990s with his striking covers on the issues of the 'Knightfall' series. Kelley would go on to illustrate nearly all of the other covers in the event and finally become the regular penciller for a lengthy run on the 'Batman' comic book in the mid-1990s. SHOW NOTE - (29:37): Eric mentions transferring to Virginia Commonwealth University and their Communication Arts program. Illustrator Sterling Hundley is one of the instructors and several alumni such as Pfeiffer, Richie Pope, Jeffery Alan Love and Chris Visions have become young illustrators currently making waves in the art world. 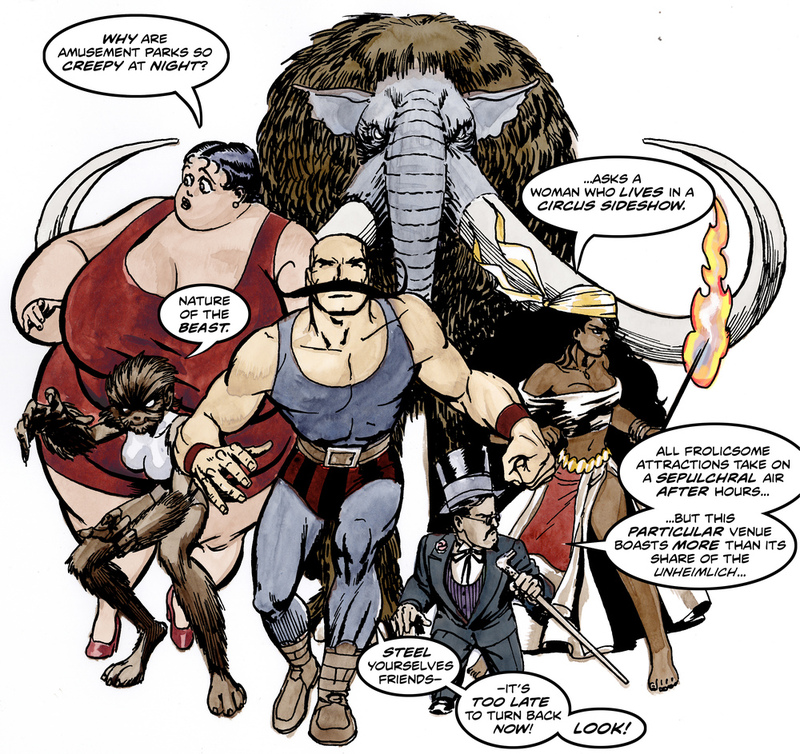 (clockwise from left) Sterling Hundley, Jeffery Alan Love, Chris Visions and Richie Pope. After a lengthy hiatus due to health matters, Adrian returns to the mic in a conversation with comic book inker Marc Deering. Deering is an industry veteran with a career spanning over a decade in the business. He's brought his superb touch to titles such as Superman, GI Joe, Miranda Mercury, Justice League and Supergirl and worked with Marvel, DC Comics, IDW, and Archaia to name a few. Marc and I discuss 'breaking in' to comics as an inker, tools of the craft, the mental aspect of inking and using digital tools in your inking workflow. Also, as a new ongoing addition, we are including Show Notes starting with this episode here on the site. These notes will be time-marked according to their appearance in the conversation so feel free to take a look before or while you listen to see examples of what is being discussed. Scroll down and take a look! Judge Dredd - Inked by Deering over Kelsey Shannon (and is one of Adrian's favorite pieces by Marc EVER). Green Lantern - Inked by Deering over penciller Ryan Benjamin. Wonder Woman - Inked by Deering over Jim Lee pencils. SHOW NOTE - (21:32): The art team of penciler Joe Madureira and inker Tim Townsend made their huge mark on 'Uncanny X-Men' in the late 1990s; ushering a slick, manga-influenced style to mainstream comics. This is the original art for the cover of the issue that Marc and I mention. SHOW NOTE - (1:02:31): Marc mentions starting to ink some of his professional work using an iPad Pro and the Procreate app. Here are actual screenshots from Marc showing the same. On this episode, Adrian speaks with one of his favorite comic book artists Jon Bogdanove. Bogdanove is most known for delivering his dynamic and powerful art with an 80-plus issue run on DC Comics' Superman: Man Of Steel title. With writer Louise Simonson, he also co-created the character Steel during the Death & Return of Superman saga in the early 1990s. Jon expounds upon his earliest influences such as the classic Adventures of Superman television series and the work of legendary comic book artist Jack Kirby. He also gives a behind-the-scenes peek into how the Death & Return of Superman storyline was orchestrated and the inspirations for the character Steel. Lastly, Bogdanove discusses being a ’style chameleon’, his outreach in teaching art to middle-schoolers and his creator-owned comic Strongman. Daredevil, Karen Page and Typhoid Mary by Michel. Copyright 2016 Marvel Comics. Michel (left) and Adrian meet for the first time at HeroesCon 2011. On this episode, Adrian speaks with artist/educator Kevlen Goodner in a lively conversation. Goodner relates how hip-hop and comics influenced his formative years in his native Louisville, Kentucky; outreach through comic book workshops with his son (and recent Kubert School graduate) Justice; drawing in public to focus on craft and win friends and clients; and using social media under his moniker 'The Illest Strator'. On this episode, Adrian speaks with artist Mel Milton in a hugely inspirational conversation regarding his pursuit of happiness through art. A former animator, Milton has garnered increasing acclaim online for posting his daily 'dooks'; drawings and studies for his personal pleasure and edification in various media. Mel discusses the true meaning of his 'dooks', drawing daily, why success may not be measured by getting your dream job, his overwhelming emotion attending his first ComicCon and striving for 51% happiness every day. On this episode, Adrian speaks with creator Shawn Pryor in an engaging conversation about the science of crowdfunding. As a former president of Action Lab Entertainment, Shawn has developed several successful crowdfunding campaigns for various comic book and graphic novel projects. Most recently, he ran a hugely successful campaign under his own company, Crowntaker Studios, to fund his creator-owned all-ages comic 'Cash and Carrie' with co-creators Giulie Speziani and artist Penny Candy Studios. In addition, Shawn discusses stepping away from the comic book business to reassess his place within it, his return and the inspirations for his upcoming football comic F.O.R.C.E with co-creators B. Alex Thompson and artist Jay Reed. On this episode, Adrian speaks with Oregon-based illustrator Patricia Smith in a lively chat about being a (relatively new) stay-at-home freelancer. Patricia incorporated her Studio Smugbug a little over two years ago and went full-time into freelancing. We discuss being proactive in establishing new markets and clients for yourself, getting gigs outside of your comfort zone, finding revenue streams with your own art, Patreon pages and more! On this episode, Adrian speaks with cartoonist Ulises Farinas (GAMMA, The Amazing Forest, Judge Dredd) in a thoughtful discussion on the comics industry. The 'Loser Mentality', Writer vs. Artist, equality (and lack thereof) and Farinas' lecture 'Being Unethical To Succeed in Comics' are just some of the issues explored. On this episode, Adrian speaks with Julian Lytle (creator/artist of Antz webcomic, film reviewer and pop culture commentator) on using social media as a creative artist. Julian explains the power and connectivity and tips to maximize your social media experience to its fullest potential in getting your work out to the world. A great conversation that is not to be missed! On this inaugural episode of 'Artist Proof with Adrian Johnson', our guest is Anthony Piper. Piper is the creator/artist of the smash hit webcomic 'Trill League' and we discuss his Kickstarter being funded within two days, his artistic origins and what it takes to make it as an artist in today's brisk paced digital workplace and more! Also, Adrian lays down the M.O. for the show going forward just this once.